The YFCU’s annual dairy stock judging county and area heats, run in association with Ulster Bank have taken place at farms throughout Northern Ireland. The Co Fermanagh and Co Tyrone heats were held on Thursday 13th April at Jamie Sproule’s farm in Castlederg. The dairy judges Kenny Hawkes, Trevor Armstrong, William Crawford and Trevor Keatley. 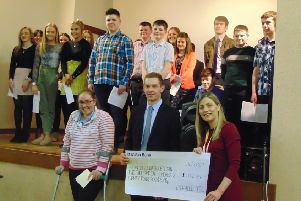 The YFCU would like to take this opportunity to thank the judges for their time and expertise and thank Jamie Sproule for hosting this event and to our sponsor Ulster Bank and the representative from Ulster Bank that came on the night Ciaran Cassidy. All those members placed will now attend the stock judging finals which will be held on Thursday 6th July, 2017 (venue TBC).